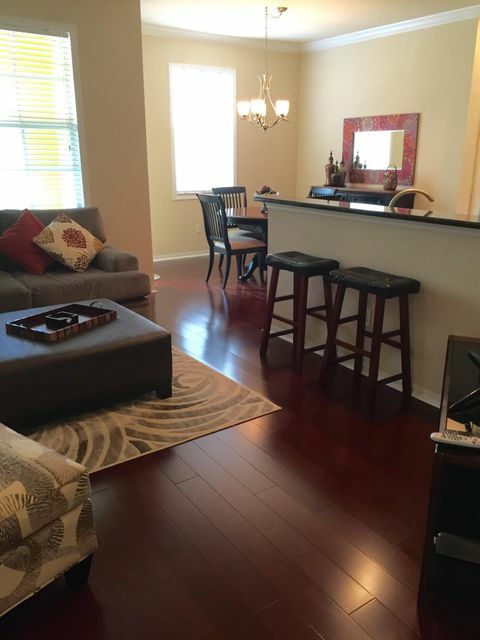 This Townhome offers 2 Bedrooms, 2 Baths, loft/office area and 1 car garage. Terrific location at Sandpiper Cove. A large foyer entrance with Brand New Carpet up the staircase leads to spacious great room with Real Cherry hardwood Flooring + volume ceilings. Open kitchen offers beautiful Cherry Cabinetry, Granite counters and Stainless Appliances. Additional features include HURRICANE IMPACT GLASS, Relaxing Balcony, Designer Paddle fans, and Plenty of Storage. Sandpiper at Botanica offers a Community Pool, Tennis, and is Walking Distance to Publix, Starbucks, and all the shops in Sea Plum Plaza. 10 Minutes to the Beach, 20 minutes to the Airport.